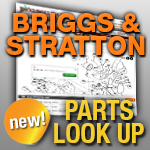 Your replacement Briggs and Stratton Governor is here! Whether you have a lawn mower, snow blower, or generator with a Briggs and Stratton engine, we have the governor you need to get your equipment back up to speed. Find a replacement governor spring, governor gear, or governor link below.